And well, Mark does know best. According to State of Inbound’s 2017’s marketing survey, video-friendly platforms rank as the highest content distribution channels. 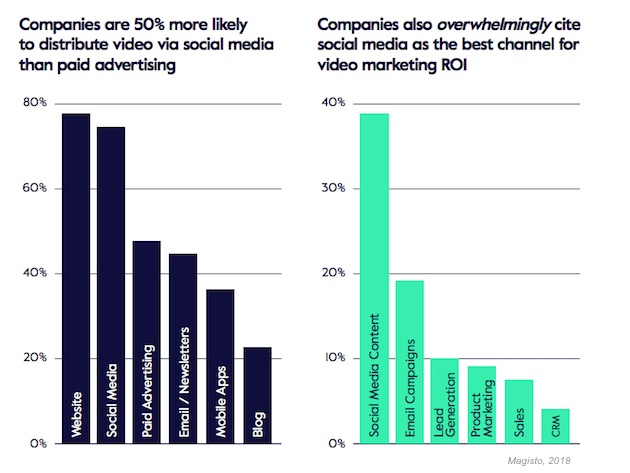 Social platforms are introducing one feature after another to enhance user’s video experience and help brands create even better videos, brands are multiplying their video budgets and calling it a video-first world, and businesses are quintupling their conversions and reaching their marketing goals in a much shorter time through video. But how important is it for your brand? Does your brand even need video? You can’t go into it blindly (just because everyone’s doing it) so before jumping into it, what questions should you ask yourself? 1. 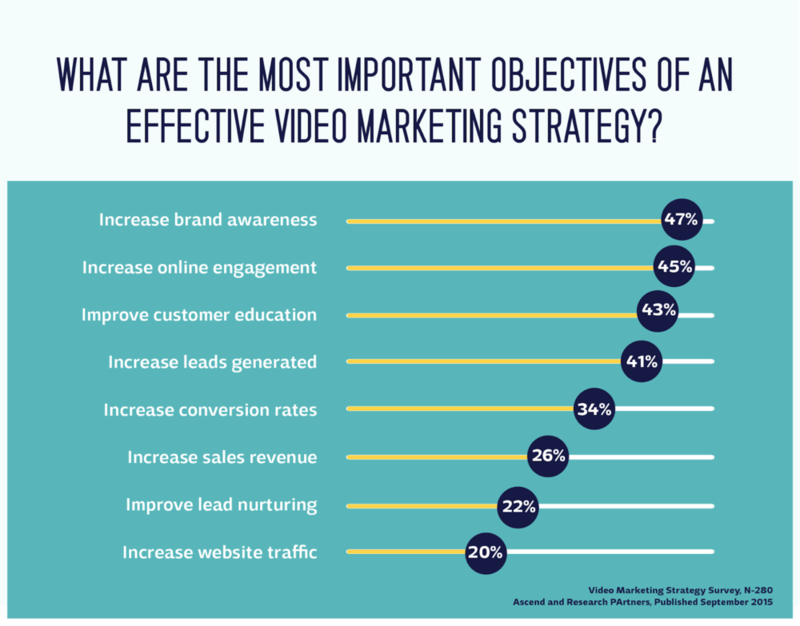 Will video help you achieve your marketing goals? Digital world is fast-moving. Every day a new fad pops up, and brands are required to quickly adopt them and use them because FOMO. However, not every fad, marketing tactic, or social media platform may work for your brand. And brands need to carefully evaluate their marketing goals before jumping into anything new. While video marketing isn’t the latest fad by any stretch of imagination, it’s still a marketing strategy that might not work for everyone. So before creating any kind of marketing strategy, write down your goals and see if that strategy aligns with them. 2. What action do you need your video audience to take? This is closely related to your goals. Once you’ve outlined them, get really specific. For example, if your goal is to increase customers, what specific action do you want your video viewers to take? Send them to another video - product feature, tutorial, etc. Your goals, and the specific action you want viewers to take, will determine the kind of video you need to create, the platform you should host it on, and shape the rest of your marketing strategy. You don’t want to shoot in the dark with videos since they can be quite costly and time-consuming. 3. Will your audience respond to video? But, if you’re targeting seniors and baby boomers, you might need to focus more on traditional media than digital media. You need to hone in your ideal customer and see if they like watching online videos or not, and what kind of videos they prefer. Just because everyone’s creating short, bite-sized videos on social media doesn’t mean you need to, too. Your audience might respond better to a 20 min product tutorial hosted on YouTube. Conduct surveys, search online in niche forums and social platforms, use social monitoring tools, or ask them directly. 4. What kind of budget do you have to invest in video? How much are you willing to spend on video marketing? $5000? $15000? 5% of your entire marketing budget? Or … $100? Your video marketing budget will determine several factors of your video content and video production process. Videos can get super-expensive, super-fast. Video equipment, video editing software, production costs (an average videographer salary is $28.28 per hour), whether you’re outsourcing it or doing it in-house, promoting these videos via paid social ads, hiring assistants for other video promotions, and so on - everything costs money. You can increase or decrease costs of certain things depending on your budget and priorities. Next ask yourself, how long do you want to run your video campaign? You need to produce videos consistently over a certain period of time to see significant results. It’s not a one-off project. So while establishing your video budget take this factor into account, as well. Ask yourself, do you have the finances required to invest in this long-term strategy? 5. What social platforms do you want to focus on? Do you already have solid presence on major social media platforms, like Facebook, Instagram, LinkedIn, Twitter? Are you seeing substantial results through them? If yes, then focus on creating videos for these platforms and further strengthening your hold on the audience there. If not, then conduct a research to find out which social platforms would get you the best results. Video content is a fickle thing. Each platform has a list of dos and don'ts for the kind of the videos that work on them. For example, a video on Facebook works without audio, so you’ll need to make one that’s visual-heavy with captions (if need be). Square videos outperform landscape videos when it comes to engagement, views and completion rate, so for social media (and particularly for mobile devices) you need to create square videos. So, you need to be very clear about the social platforms you want to focus on initially, and back it up with solid data instead of hearsay and i-think-this-might-work thoughts. 6. How will your video set you apart from your competitors? Find out if your competitors are using video to market their brand or not. If they haven’t yet started using video marketing for their brand, then you already have an advantage over them. But if they are, you need to figure out how you can create a video strategy that sets you apart from your competitors. With so much video content going around in the digital world, it’s hard to come across content that’s different and refreshing. It’s the same old, rehashed crap everywhere that everyone's tired of now. So try to come up with a different concept, a different marketing strategy, a different something. It can be anything - the kind of videos your produce, your video personality, the social network you’re using for promotion, your video CTAs, and so on. You can outline your brand’s USP and determine to use it to create video content that is different (and more appealing) than your competitors. Or you can simply choose a social platform that they’ve neglected to use, and start marketing to your audience there. Use video to stand out, not blend in. 7. Do you have a distribution strategy? A strategic distribution strategy is vital for your video marketing to work. After all, there's a reason why the content marketing community follows the 80% 20% rule - spend 20% of your time creating content and 80% distributing it via the right channels. This will help you score more shares, conversions, and achieve your marketing goals within a much shorter time. If you already have solid online presence, say a couple of thousand followers on major social platforms or a good list of email subscribers, you can use those to promote your videos and save a ton of time and effort. Eventually you can add in more distribution channels or amplify video promotions on platforms that are showing best results. However, if you’re starting from scratch, you need to build a strategic and effective distribution channel, or at least some semblance of it, before you start creating videos. Because otherwise your videos won’t get a lot of traction, you’ll end up pulling-your-hair-out frustrated and ready to ditch video for good. Don’t dive into anything half-prepared. It’s great to be spontaneous and risky, but not at the expense of your brand. So answer these questions, prepare a kickass video marketing plan, and start using video to promote your brand.